The general definitions of the six trigonometric functions are obtained from an angle placed in standard position on a rectangular coordinate system. 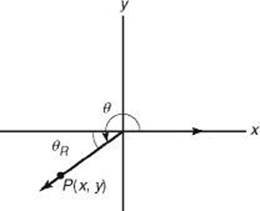 When an angle is placed so that its vertex is at the origin, its initial side is along the positive x-axis, and its terminal side is anywhere on the coordinate system, it is said to be in standard position. 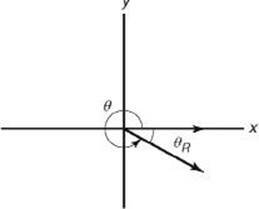 The angle is given a positive value if it is measured in a counterclockwise direction from the initial side to the terminal side, and a negative value if it is measured in a clockwise direction. sin θ and cos θ are always between –1 and 1. The distance OP is always positive, and the x and y coordinates of P are positive or negative depending on which quadrant the terminal side of lies in. The signs of the trigonometric functions are indicated in the following table. All trig functions are positive in quadrant I. Sine and only sine is positive in quadrant II. Tangent and only tangent is positive in quadrant III. Cosine and only cosine is positive in quadrant IV. 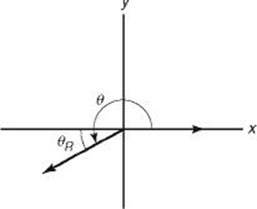 Each angle whose terminal side lies in quadrant II, III, or IV has associated with it an angle called its reference angle , which is formed by the x-axis and the terminal side. Any trig function of = ± the same function of . The sign is determined by the quadrant in which the terminal side lies. 1. Express sin 320° in terms of . Since the sine is negative in quadrant IV, sin 320° = –sin 40°. 2. Express cot 200° in terms of . Since the cotangent is positive in quadrant III, cot 200° = cot 20°. 3. Express cos 130° in terms of . 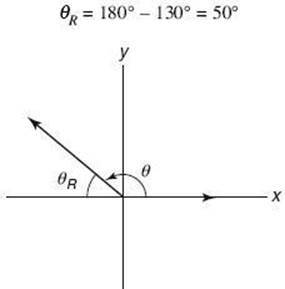 Since the cosine is negative in quadrant II, cos 130° = –cos 50°. Sine and cosine, tangent and cotangent, and secant and cosecant are cofunction pairs. Cofunctions of complementary angles are equal. If and are complementary, then trig ( ) = cotrig ( ) and trig ( ) = cotrig ( ) . 4. If both the angles are acute and sin (3x + 20°) = cos (2x – 40°), find x. Since these cofunctions are equal, the angles must be complementary. 1. Express cos 320° as a function of an angle between 0° and 90°. 4. If x is an angle in quadrant III and tan (x – 30°) = cot x, find x. 5. If 90° < < 180° and 270° < < 360°, then which of the following cannot be true?